If you’re in the online marketing industry, you should definitely attend SMX. Today, I attended SMX West San Jose 2013. 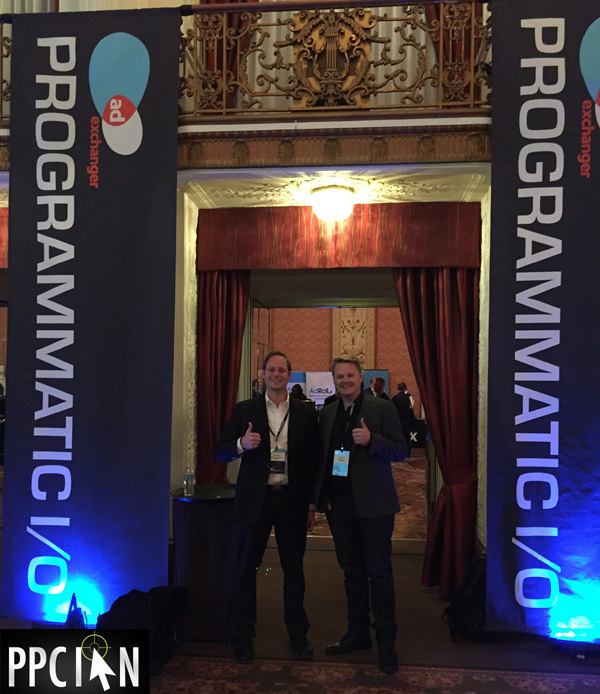 I’m thrilled to recap my fun times at the event and share some pictures of PPC Ian with friends from the online marketing industry. (After reading today’s post, you may also wish to check out my 2012 and 2011 recaps.) 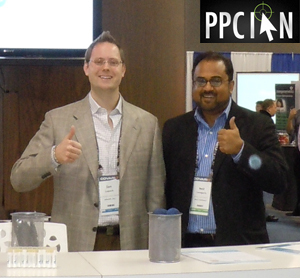 There are two more days left in SMX West 2013 so you should definitely try to make it if you are in the SF Bay Area! SMX is all about the people. I primarily attend these conferences for networking and today’s conference totally delivered. In fact, as soon as I stepped out of my car in the convention center parking lot, I ran into my friend Snejana Norris. We used to work together at QuinStreet, and now Snejana is Senior Manager, Marketing at LendingTree. What a funny coincidence that we both arrived to SMX West at the same time! Upon first arriving, the conference seemed a little quiet. There were not a ton of attendees. This surprised me since online advertising is a huge industry and we’re in the online marketing capital of the world, the SF Bay Area! However, I also know just how busy I am right now – so much that I could only spend a partial day at SMX West this year. Perhaps other online marketing professionals are hard at work, too busy to pause for the conference. Despite the quiet feel, the conference was amazing. Those who did attend, speak, and support the conference are top quality online marketers. As soon as I arrived at the conference, I went to the paid search track. I was totally impressed. This year, SMX West over-delivered on content. 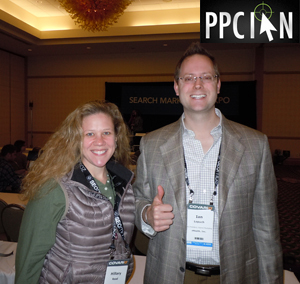 In fact, the paid search track felt almost like SMX Advanced. The quality of the presentations, the insightful tips, and the level of engagement as very exciting. I have been in this industry since 2004 and I still learned a few new insights from the presentations. Nice work, panelists! My favorite session? The remarketing one for sure. After the first session, I went to grab some refreshments and ran into my friend Eli Schwartz. 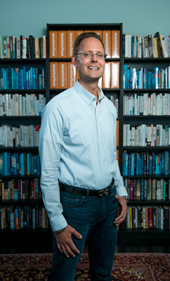 We used to work together at QuinStreet and now Eli is Online Marketing Manager at SurveyMonkey. What a small world! 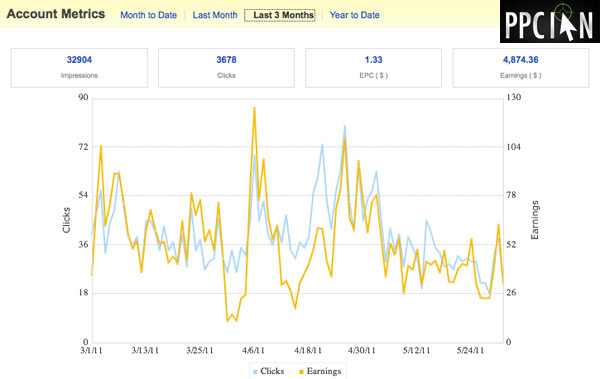 After refreshments, I went back to the paid search track. I sat down on the aisle, noticing that someone’s stuff was already on the seat next to me. After a few minutes, none other than Hillary Read sat down next to me. What an awesome coincidence! Hillary is Marketing Manager at PPC Associates SEM Agency. If you have been reading PPC Ian for a while, you know that PPC Associates is a true friend of my blog. In fact, I have a guest post that will be going live on the PPC Associates blog soon (I’ll let you know when it’s live so you can check it out). Upon completion of a solid morning of networking and absorbing online marketing knowledge, it was time for lunch. Mike (from my team) and I went to Arcadia Restaurant. Arcadia is on the ground floor of the Marriott hotel and is awesome. Arcadia is a tradition for Mike and I, and this was our third year enjoying the burgers there. I highly recommend it – the food is delicious, especially the angus burger. After lunch, I went to the expo hall. I especially enjoyed connecting with my good friends from Marin Software. Their booth was front and center. 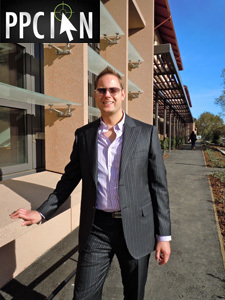 I enjoyed learning more about Marin’s social platform from Neil Lunagaria, Director of Social Platform. 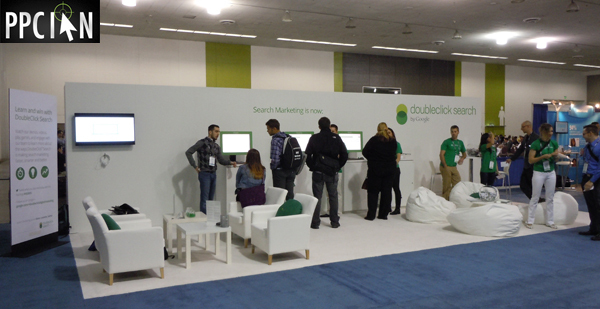 I also thoroughly enjoyed the DoubleClick Search booth (check out the picture below). Google went big this year demoing their new DoubleClick Search platform and I must say I’m impressed. My favorite feature: DoubleClick Search offers intra-day bidding, updating bids 4x per day on both Google AdWords and Bing Ads. Nice work! It’s at this time that I decided to head back to the office to get some work done. While I only got to spend a partial day at SMX West, I truly enjoyed my time. Also, I am thrilled to know my team will be attending the rest of the week and reporting back on their discoveries. I hope to see you at a future SMX conference! Looks like you had a great time. Thanks for sharing some of the pictures and info from the event. I will be sure to check out your recaps from previous years. Thanks, Robert, for the comment! Sounds like an amazing EXPO. Can’t wait to see the double click search in action. 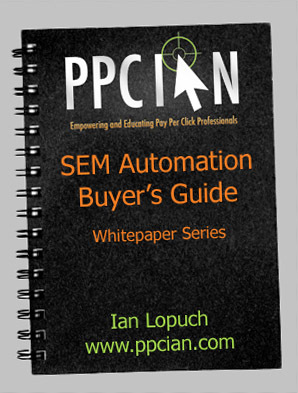 That should help ppc campaigns a lot.